Synopsis: Audrey can’t leave the house. she can’t even take off her dark glasses inside the house. I picked this book up at my local supermarket last week with the intention of it being a quick read that wouldn’t blow me away. As it turns out, I couldn’t have been any more wrong! Yes, this one might be short, but that doesn’t stop it being touching, lovely and inspirational. Everything you could want from a book! The plot…is smooth. That might be a weird way to describe it, but I honestly felt like I was gliding through the pages as though I was dancing on ice. It felt easy, and free. The characters…how do I even begin to describe how much I related to Audrey? To put it simply, she is not the only one who suffers from social anxiety. Although I’ve never been quite as extreme as her, there have been points when it’s been close. And only now, after first realising I had social anxiety 6 years ago (and having to come out of school because of it) am I managing to finally overcome all of my fears. The writing…was so easy to read! 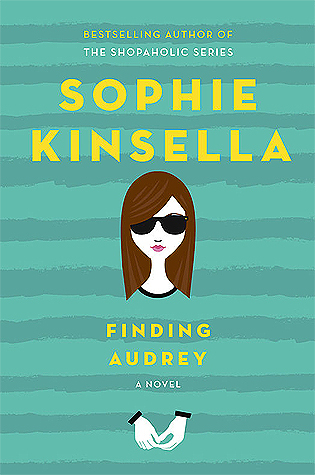 I felt just like I was Audrey’s friend, and I couldn’t stop reading. I really wanted to find out the next part, and the next part. In the end, it only took me around a day to read this book! Something I liked…erm, this book?! How do I put my finger on one thing? Okay, maybe that’s easier than I’m making out…because Linus is adorable. Something I disliked…nothing. Absolutely nothing! What an incredible read. All I can say is this: if you have ever suffered from any sort of anxiety or depression…read this. God, at least peek at the quotes. Trust me, you’ll soon see what I mean about this book. I adored this book too! Sounds like a great book! I also like the quote you put at the end. Really great review, I think you finally convinced me to read this one! Oh it’s cool to hear it’s not just me loving this one 😀 I’ll make sure to check out Twenties Girl!